4. All Orthodox patriarchs and prelates of the catholic Church [are] to agree and to accept everything that has been decreed and ordained by the Ecumenical Synods, either by their personal presence or by their own legate, or deputy, or, in the absence of such a representative, by means of a letter of their own. 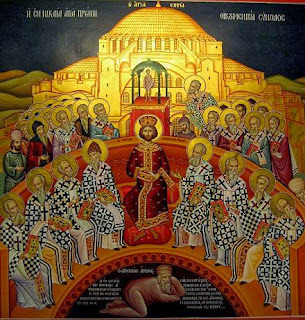 The current idea among many Orthodox that an Ecumenical Council becomes finally official when it is recognized by a subsequent Ecumenical Council has no basis in Roman Law. Each such Council became Roman Law the moment when its minutes were signed on the spot by the participating Patriarchal and Metropolitan Synods and countersigned by the Emperor himself. Heretics and their heresies were condemned on the spot and not at a subsequent Ecumenical Council. Their Creeds and Horoi became Roman Law on the spot. The Creed of 381 became the Orthodox Creed on the spot in 381and not in 431 which simply repeated the Creed of 381 as did each subsequent Ecumenical Council. After the Roman Emperor and Empire fell in 1453 the Four Roman Patriarchates of Constantinople New Rome, Alexandria, Antioch and Jerusalem continued to convene Church Councils which continued the tradition of the Ecumenical Councils. The only reason why these Councils are not called "Ecumenical" is simply that this title means "Imperial" since the decisions of these Ecumenical Councils became part of Roman Law. In other words the decisions of the Roman Councils after 1453 are part of Church Law, but no longer part of Imperial law. There was no longer a Roman Empire and Roman Emperor to enact Roman Law. So these Nine Ecumenical Councils are at the same time both Church Law and Roman Law. The Councils convened after 1453 are part of Church Law and with no less authority than Ecumenical Councils, except in the imagination of modern Orthodox misled by the Russian Orthodoxy of Peter the Great. So there are now Orthodox who even call themselves the Church of the Seven Ecumenical Councils. Most Orthodox are in a state of limbo about the Eighth and Ninth Ecumenical Councils. The Eighth Ecumenical Council of 879 simply condemned those who either "add to" or "subtract from" the Creed of 381 and also those who have not yet accepted the teaching of the Seventh Ecumenical Council about Icons. The Franks condemned were not mentioned at the time in order to allow them to reconsider. The Ninth Ecumenical Council of 1341 condemned the Platonic mysticism of Barlaam the Calabrian who had come from the West as a convert to Orthodoxy.